The New Democracy (Greek: Νέα Δημοκρατία, Nea Dimokratia, IPA: [ˈnea ðimokraˈtia]), also referred to as ND (ΝΔ) by its initials, is a liberal-conservative political party in Greece. In modern Greek politics, New Democracy has been the main centre-right political party and one of the two major parties along with its historic rival, the Panhellenic Socialist Movement (PASOK). Having spent two and a half years in government under the presidency of Antonis Samaras, New Democracy lost its majority in the Hellenic Parliament and became the major opposition party after the January 2015 legislative election. The party was founded in 1974 by Konstantinos Karamanlis and in the same year it formed the first cabinet of the Third Hellenic Republic. New Democracy is a member of the European People's Party, the Centrist Democrat International and the International Democrat Union. New Democracy was founded on 4 October 1974 by Konstantinos Karamanlis, in the beginning of the metapolitefsi era following the fall of the Greek military junta. Karamanlis, who had already served as Prime Minister of Greece from 1955 to 1963, was sworn in as the first Prime Minister of the Third Hellenic Republic in a national unity government on 24 July 1974, until the first free elections of the new era. He intended New Democracy to be a more modern and progressive political party than the right-wing parties that ruled Greece before the 1967 Greek coup d'état, including his own National Radical Union (ERE). The party's ideology was defined as "radical liberalism", a term defined as "the prevalence of free market rules with the decisive intervention of the state in favour of social justice." The party was formed out of dissident members the pre-Junta Centre Union and National Radical Union, both of former Monarchists and Venizelists. In the 1974 legislative election, New Democracy obtained a massive parliamentary majority of 220 seats with a record 54.37% of the vote, a result attributed to the personal appeal of Karamanlis to the electorate. 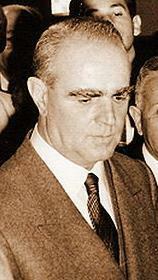 Karamanlis was elected as Prime Minister and soon decided to hold a referendum on 8 December 1974 for the issue of the form of government; with a large majority of 69.17%, monarchy was eventually abolished in favour of a republic. The next major issue for the New Democracy cabinet was the creation of the Constitution of Greece, which entered into force in 1975 and established Greece as a parliamentary republic. On 12 June 1975, Greece applied to join the European Communities, of which it was already an associate member since 1961, while it had already been readmitted to the Council of Europe on 28 November 1974. In the 1977 election, New Democracy won again a large parliamentary majority of 171 seats, albeit with a reduced percentage of popular vote (41.84%). Under Karamanlis, Greece redefined its relations with NATO and tried to resolve the Cyprus dispute following the Turkish invasion of the island. In 1979, the first conference of the party was held in Chalkidiki, where its ideological principles defined under the term "radical liberalism" were unanimously approved, as well as its statute and the operating regulations of its organizations. It was the first conference of any Greek political party whose delegates were elected by the members. Karamanlis' vision concerning the accession of Greece into the European Communities, despite the resolute opposition of the Panhellenic Socialist Movement (PASOK) and the Communist Party of Greece (KKE), led to the signing of the Treaty of Accession on 28 May 1979 in Athens; following the ratification of the act by the Hellenic Parliament on 28 June 1979, Greece became the tenth member state of the European Communities on 1 January 1981. Karamanlis was criticised by opposing parties for not holding a referendum, even though Greece's accession into the European Communities had been in the forefront of New Democracy's political platform, under which the party had been elected to power. Meanwhile, Karamanlis relinquished the premiership in 1980 and was elected as President of Greece by the parliament, serving until 1985. Georgios Rallis was elected as the new leader of New Democracy and succeeded Karamanlis in premiership. Under the leadership of Georgios Rallis, New Democracy was defeated in the 1981 legislative elections by Andreas Papandreou's PASOK which ran on a left-wing populist platform, and was placed in opposition for a first time with 35.87% share of the vote and 115 seats. In the same day, on 18 October 1981, New Democracy was also defeated in the first Greek election to the European Parliament. In the following December, the party's parliamentary group elected Evangelos Averoff, former Minister for National Defence, as president of New Democracy, but he resigned in 1984 due to health problems. On 1 September 1984, Konstantinos Mitsotakis succeeded him in the party's presidency and he managed to increase its percentage in the 1985 elections to 40.85%, although it was defeated again and remained in opposition. Mitsotakis led New Democracy to a clear win in the June 1989 legislative elections registering 44.28% of the vote but, due to the modification of the electoral law by the outbound PASOK government, New Democracy obtained only 145 seats which were not enough to form a government on its own. The aftermath was the formation of a coalition government under Tzannis Tzannetakis, consisted of New Democracy and Coalition of the Left and Progress (Synaspismos), with the latter also including at the time the Communist Party of Greece. In the subsequent elections of November 1989, New Democracy took one more comfortable win, increasing its share to 46.19% of the vote and 148 seats but, under the same electoral law, they were still short of forming a government and this led to a national unity government along with PASOK and Synaspismos, under Xenophon Zolotas. Eventually, in the 1990 election Mitsotakis' New Democracy defeated once again Papandreou's PASOK with a lead of 8.28%, but this time the 46.89% of votes awarded them with 150 seats, which allowed Mitsotakis to form a majority in the parliament with the support of Democratic Renewal's (DIANA) sole member of parliament and one more seat given by the Supreme Special Court, after a mistake in seat calculation was detected. After three consecutive wide wins with high vote percentages, Mitsotakis became the 178th Prime Minister of Greece, though with a slim parliamentary majority of 152 seats due to the electoral law in force at the time. In a turbulent international political environment following the 1989 Fall of Communism in Europe, Mitsotakis' government focused on cutting government spending, the privatization of state enterprises, the reformation of the public administration and the restoration of the original electoral system, with the addition of an election threshold of 3%. In foreign policy, the priorities were the restoration of confidence among Greece's economic and political partners, NATO and the United States. Mitsotakis also supported a new dialogue with Turkey on the Cyprus dispute and a compromise over the Macedonia naming dispute; the latter triggered an irritation among the MPs of New Democracy, which led Antonis Samaras to leave it and form a new political party in June 1993, Political Spring; one more withdrawal later from its parliamentary group resulted in New Democracy's loss of the majority in the parliament and the call of early elections. In the 1993 elections, New Democracy suffered an easy defeat with 39.30% of the vote, something that led to Mitsotakis' resignation and the election of Miltiadis Evert in the party's leadership. In the early 1996 legislative election, New Democracy was defeated again by Costas Simitis' PASOK registering 38.12%, but Evert obtained a re-election as the party's leader in the same year. However, in the spring of 1997 a new conference took place, in order to elect a new president among others. Kostas Karamanlis, nephew of the party's founder, was elected the sixth president of New Democracy. Under Karamanlis, New Democracy experienced an evident increase in popularity, but in the 2000 elections they lost by only 1.06% of the popular vote, the smallest margin in modern Greek history, registering 42.74% and obtaining 125 seats in the parliament. By 2003, New Democracy was consistently leading Simitis' PASOK in opinion polls; in January 2004 Simitis resigned and announced elections for 7 March, while George Papandreou succeeded him in PASOK's leadership. Despite speculation that Papandreou would succeed in restoring the party's fortunes, in the 2004 election Karamanlis managed to take a clear win with 45.36% of the vote and 165 seats, and New Democracy returned to power after eleven years in opposition, scoring an all-time record of 3,359,682 votes in the history of Greek elections. The regions that consistently support New Democracy include the Peloponnese, Central Macedonia and West Macedonia. On the other hand, the party is weak in Crete, the Aegean Islands, Attica and West Greece. On 16 September 2007, Kostas Karamanlis won re-election with a diminished majority in Parliament, and stated: "Thank you for your trust. You have spoken loud and clear and chosen the course the country will take in the next few years." George Papandreou, PASOK, accepted defeat (New Democracy party with 41.84%, and opposition party PASOK had 38.1%). Political campaign of party New Democracy before the European Parliament election in Greece in 2009. Kiosk of political party in Athens in 2009. On 2 September 2009 Karamanlis announced his intention to call an election, although one was not required until September 2011. The parliament was dissolved on 9 September, and the 2009 legislative election was held on 4 October. New Democracy's share of the parliamentary vote dropped to 33.47% (down by 8.37%) and they won only 91 of 300 seats, dropping by 61 since the last election. The rival PASOK soared to 43.92% (up 5.82%), and took 160 seats (up 58). The 33.5% tally marked a historic low for the party since its founding in 1974. Karamanlis conceded defeat and stated that he would resign as a leader of New Democracy, and would not stand as a candidate at the next party election. Two former Ministers for Foreign Affairs, Dora Bakoyannis and Antonis Samaras, as well as Thessaloniki Prefect Panagiotis Psomiadis were announced as candidates, with Samaras being the favorite to win. On 29 November 2009, Antonis Samaras was elected the new leader of New Democracy by the party base at the 2009 leadership election. Following early results showing Samaras in the lead, his main rival Dora Bakoyannis conceded defeat and congratulated Samaras for his election; later she left New Democracy to found her own party, Democratic Alliance. Samaras himself had also left New Democracy in 1992 because of his hard stance on the Macedonia naming dispute and found his own party, Political Spring; he returned to New Democracy in 2004. New Democracy was in opposition during the first phase (2009–11) of the Greek government debt crisis which included the First bailout package agreed in May 2010. The party did not support the first EU/IMF rescue package of May 2010 and the three related austerity packages of March 2010, May 2010 and June 2011. Further measures were agreed by prime minister George Papandreou with the EU and private banks and insurers on 27 October 2011. The aim was to complete negotiations by the end of the year and put in place a full Second bailout package to supplement the one agreed in May 2010. Samaras initially blasted the deal. In reality New Democracy had dismissed cross-party agreement even before the deal was agreed. A few days later, Papandreou announced a surprise referendum. During the frantic negotiations that followed, Samaras offered to support the austerity package he had initially condemned if Papandreou resigned and an interim government be appointed to lead the country to elections early in the new year. The referendum was never held, and Papandreou resigned in early November 2011. New Democracy supported the new national unity government headed by Lucas Papademos; however the party's support for austerity appeared lukewarm at first. Within a few days, party officials spoke of "renegotiating" existing agreements with the EU and IMF. EU partners requested that Samaras sign a letter committing him to the terms of the rescue package, in what was seen as an effort to keep the nationalist elements of his party happy. Samaras argued that his word should be enough and that the demand for a written commitment was "humiliating". Both Papademos and the EU insisted on a written commitment. New Democracy repeated its call for new elections. Samaras was said to be infuriating European leaders by only partly backing the international reform programme. A meeting of Eurozone's Finance Ministers was postponed in February 2012, when it became apparent that not all the main political parties were willing to pledge to honour the conditions demanded in return for the rescue package; a day later Samaras reversed course and wrote to the European Commission and IMF, promising to implement the austerity measures if his party were to win a general election in April. German finance minister Wolfgang Schäuble suggested postponing the election and setting up a small technocratic cabinet like Italy’s to run Greece for the next two years. In May 2012 general election, the New Democracy regained the largest party but could not obtain a majority. Anti-austerity leftist SYRIZA, led by Alexis Tsipras became the second largest party and refused to negotiate with New Democracy and PASOK. After the general election the New Democracy could not form a coalition government. New Democracy during its rule introduced a strict immigration policy, and proposed strengthening this policy as part of its political agenda. In its electoral campaign for the January 2015 legislative election, Samaras promised to continue with his plan to exit the bailout and return to growth by further privatizations, a corporate tax rate reduced to 15 percent and a recapitalization of Greece's banks. The party received a total of 747,214 € of state funding, the largest share of all political parties in Greece. In the election, ND was defeated by SYRIZA. On 5 July 2015 Samaras stepped down from party leadership. New Democracy was once again defeated by SYRIZA in the September 2015 legislative election, but maintained its number of seats in the Hellenic Parliament. On 10 January 2016 Kyriakos Mitsotakis was elected as new party leader. On 4 October 2018, the party adopted a new logo. New Democracy is a member of the European People's Party, the largest European political party since 1999, and its MEPs sit with the EPP Group in the European Parliament. Internationally, New Democracy is a member of the Centrist Democrat International, and the International Democrat Union. Traditional symbol of the party was Greek freedom torch. ^ a b "Kostis Hatzidakis and Adonis Georgiadis appointed New Democracy VPs". To Vima. 18 January 2016. ^ a b José M. Magone (2003). The Politics of Southern Europe: Integration Into the European Union. Praeger. p. 148. ISBN 978-0-275-97787-0. ^ a b Derek W. Urwin (2014). The Community of Europe: A History of European Integration Since 1945. Routledge. p. 206. ISBN 978-1-317-89252-6. ^ Lawrence Ezrow (2011). "Electoral systems and party responsiveness". In Norman Schofield; Gonzalo Caballero (eds.). Political Economy of Institutions, Democracy and Voting. Springer Science & Business Media. p. 320. ISBN 978-3-642-19519-8. ^ a b Robert Thomson (2011). Resolving Controversy in the European Union: Legislative Decision-Making before and after Enlargement. Cambridge University Press. p. 90. ISBN 978-1-139-50517-8. ^ "Αυτά είναι τα τραγούδια της ΝΔ: Ο «Ανώνυμος Οννεδίτης» του Ουίλιαμς και τα έντεχνα του Χατζηκοκόλη!". thecaller.gr. Retrieved 25 September 2018. ^ a b "History". New Democracy official website (in Greek). Retrieved 23 January 2015. ^ "The accession of Greece". CVCE. 11 September 2012. p. 2. Retrieved 23 January 2015. ^ a b Lauth Bacas, Jutta (2004). Ethnologia Balkanica. LIT Verlag. p. 8. ^ Carassava, Anthee (3 September 2009). "Greek Premier, Dogged by Many Troubles, Takes Risk With Snap Elections". The New York Times. ^ a b "National elections, October 2009". Ministry of the Interior. Retrieved 28 March 2012. ^ Becatoros, Elena (4 October 2009). "Socialists Trounce Conservatives in Greek Elections". The Huffington Post. ^ Smith, Helena (5 October 2009). "Greek socialists achieve resounding win in snap election". The Guardian. ^ "ND heads for tense election showdown". Kathimerini. 28 November 2009. Archived from the original on 25 February 2012. ^ "Samaras keeps lead in ND race". Kathimerini. 23 November 2009. Archived from the original on 23 February 2012. Retrieved 28 March 2012. ^ "Καθαρή νίκη Σαμαρά (Clear victory of Samaras)". Ta Nea (in Greek). 30 November 2009. ^ "Σαμαράς: "Νικήσαμε όλοι. Δεν υπάρχουν ηττημένοι" (Samaras: "We all won, there are no losers")". Ta Nea (in Greek). 29 November 2009. ^ Tagaris, Karolina (4 November 2011). "Greek opposition leader's U-turn opens path to power". Reuters. ^ "Greek parliament approves bill with austerity measures despite protest". Xinhua News Agency. 6 March 2010. ^ Smith, Helena (6 May 2010). "Greece approves sweeping austerity measures". The Guardian. ^ Donadio, Rachel; Kitsantonis, Niki (30 June 2011). "Greek Parliament Approves Implementation of Austerity Plan". The New York Times. ^ "Eurozone leaders, bankers agree 50 pct haircut for Greece". Ekathimerini. 27 October 2011. Retrieved 10 March 2012. ^ "Stocks up, but ND blasts debt deal". Ekathimerini. 27 October 2011. Retrieved 10 March 2012. ^ "Cross-party support appears unlikely". Ekathimerini. 25 October 2011. Retrieved 10 March 2012. ^ "Papandreou calls for referendum on EU debt deal". Ekathimerini. 31 October 2011. Retrieved 10 March 2012. ^ "Samaras: Our proposal is still on the table". Ekathimerini. 5 November 2011. Retrieved 10 March 2012. ^ "Samaras gives limited support to 'transitional' gov't". Ekathimerini. 14 November 2011. Retrieved 10 March 2012. ^ "Greece's politicians: In their own time". The Economist. 10 November 2011. Retrieved 9 March 2012. ^ "ND takes more offensive stance". Ekathimerini. 29 November 2011. Retrieved 10 March 2012. ^ "Samaras ousts MP over 'far-right' comments". Ekathimerini. 14 November 2011. Retrieved 10 March 2012. ^ "Greece's government: Divided they stand". The Economist. 16 November 2011. Retrieved 9 March 2012. ^ "Charlemagne: Angela the lawgiver". The Economist. 4 February 2012. Retrieved 9 March 2012. ^ a b "Greece and the euro: From tragedy to farce". The Economist. 15 February 2012. Retrieved 9 March 2012. ^ Nick Malkoutzis (30 March 2012). "Is immigration a bigger issue for Greece than the economy?". Kathimerini. Retrieved 15 May 2016. ^ "Elections 2015 Party Profiles". 21 January 2015. Retrieved 25 January 2015. ^ "Elections 2015 Facts & Figures". 21 January 2015. Retrieved 25 January 2015. ^ Pappas, Gregory (5 July 2015). "Greek Opposition Leader Antonis Samaras Resigns as New Democracy Head". The Pappas Post. Retrieved 14 February 2019. ^ Reuters (10 January 2016). "Kyriakos Mitsotakis elected as leader of Greek centre-right party". The Guardian. ISSN 0261-3077. Retrieved 14 February 2019. ^ Kampouris, Nick. "Greece's New Democracy Marks 44th Anniversary Launching New Logo | GreekReporter.com". Retrieved 14 February 2019. ^ "Parties". Centrist Democrat International. Archived from the original on 27 March 2012. Retrieved 6 June 2012. ^ "Member parties". International Democrat Union. Archived from the original on 1 July 2014. Retrieved 30 January 2015. ^ "Kyriakos Mitsotakis elected as leader of Greek centre-right party". the Guardian and Reuters in Athens. 10 January 2015. Retrieved 11 January 2015. Wikimedia Commons has media related to New Democracy (Greece).